We are Migrating the blog here: http://singaporehedgefund.com – faster, better,bigger…….HONG KONG — Securities regulators here scored another criminal conviction for insider trading after an ex-banker at CLSA Equity Capital Markets Ltd. and a former hedge fund manager both pleaded guilty to charges of insider dealing Tuesday. The two were remanded in jail custody and await sentencing on July 13. This case is the Hong Kong Securities and Futures Commission’s eighth conviction for insider trading over the past 12 months, and underscores the watchdog’s recent efforts to toughen up its record. Additional cases are pending. 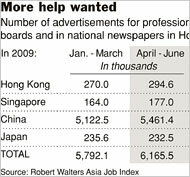 In pressing its case, the regulator accused Allen Lam, a former CLSA investment banking director, and Ryan Fong, an ex-hedge fund manager at HSZ Ltd., of improperly trading Hong Kong-listed shares of Media Partners International Holdings Inc., an outdoor advertising company based in Shanghai. According to the regulator, in 2005, the CLSA banker tipped off Fong that a buyer would soon be acquiring a controlling stake in Media Partners, paying a substantial premium to the market price for the shares. At the time, CLSA was acting as the buyer’s financial adviser. Fong then went about accumulating 10.6 million Media Partner shares at prices ranging between 60 and 83 Hong Kong cents (roughly eight to 11 U.S. cents), the SFC said. The two stayed in contact via email, according to the regulator, using a code, “the French car,” to refer to the deal. On Sept. 21, JCDecaux Pearl & Dean Ltd., a rival company in Hong Kong, disclosed it would acquire 73.38% of Media Partners at HK$1.141 per share. After Media Partners’ stock rose, Fong unloaded his shares for nearly HK$1.10, the SFC stated, generating a profit of HK$3.39 million (about US$437,000) for HSZ and pocketing HK$1.03 million himself. Tuesday’s victory bolsters the SFC’s efforts to crack down on insider trading, which was only made a criminal offense in 2003. Despite Hong Kong’s role as a financial hub with one of the most liquid stock markets in the region, regulators here have been criticized in the past for lax enforcement of the city’s securities laws. But over the last year and a half, the SFC has gone on the offensive by aggressively pursuing insider trading and other market abuses. In May, the SFC won one of its biggest victories to date when a Hong Kong court supported the regulator’s request to block a bid to privatize PCCW Ltd., Hong Kong’s dominant telecommunications service provider. The SFC argued that a shareholder vote approving the deal had been rigged. The buyout group, led by PCCW chairman Richard Li, denied the claims and said it would appeal the verdict.